2015 has been a great year for me as a kdrama viewer and enthusiast. I feel like the drama production teams have showered viewers with lots of unique, interesting, romantic, and thrilling dramas. Though still there are some of the dramas who turned out to become biggest disappointment. But I’m going to discuss about those shining and blemished dramas in another post. In this post, I’m going to discuss about the brilliantness of the front-row persons of one production, which are no other than the cast. There are tons of new faces in this year’s dramas. Some are able to grab viewers’ heart and steal the spotlight, while others are failed to seize the opportunity and drowned deep. Among many new actors and actresses whose faces appears in this year’s dramas, I would say that the two names succeed in leaving a strong and good impression on me are the noona’s heartthrob Ji Soo and the fierce young lady Stephanie Lee. I will gladly enthrone them as the ultimate scene stealers in 2015’ dramas. Oh, Ji Soo. Where do I begin to talk about how amazing this youngster is. 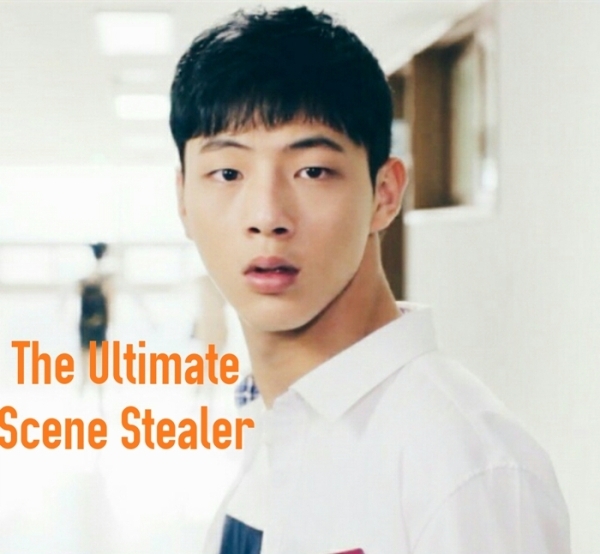 Thanks to his tremendous face and strong, well-written character in Angry Mom, Ji Soo managed to launch into stardom. Ji Soo was able to steal my focus from the first episode of the show, which is a shocker because I thought I would fall for Baro, instead of him. I’ve been admiring Baro since his performance in Reply 1994. When I learned that he was going to play in Angry Mom, I knew that he will be among many reasons why I watch the drama. But unexpectedly, Ji Soo’s performance in the drama is able to outshine Baro. His character in Angry Mom is the typical bad boy character who girls love and pity. But a strong character without a strong acting is nothing, right? Fortunately Ji Soo knew that and able to deliver such solid acting. Oh, and one last thing, doesn’t he look like Taeyang? That small yet sharp eyes and strong bone structure of him are reminds me of Taeyang. Though I never able to finish Yongpal, I will never forget Stephanie Lee’s performance in this drama. Playing Cynthia Park, Stephanie’s performance was less than stunning. Stephanie showed herself completely one with her character. Her character is not that important compared to other characters within Yongpal, but her impression is lasting. I still remember her first appearance in the drama and her lines, because she is that amazing and she is that talented. Honestly, during watching Yongpal, I’m sort of hoping that Yongpal will end up with Cynthia instead of Han Yeo Jin. How cool and extraordinary would that be! I’m really looking forward for her next drama. Though I know that she probably not in the level of a leading lady yet, I really hope that at least she would grab a second lead spot. There you go, my two ultimate scene stealers for this year’s dramas. Who’s yours?